Striking Chicago charter school teachers beef up CICS picket lines | Fight Back! Chicago, IL – Chicago Teachers Union (CTU) educators at four CICS schools struck for the third day, February 7, with management dug in on exchanging wage parity with CPS educators for higher caseloads for counselors and social workers, larger class sizes with no enforcement language, and no written guarantee not to cut student services or resources. Management wants to increase the student-to-counselor/social worker ratio, which is already well over nationally recommended ratios, giving management the wiggle room to lay off some frontline staff. Educators have refused to trade raises for larger class sizes or reductions in student services. 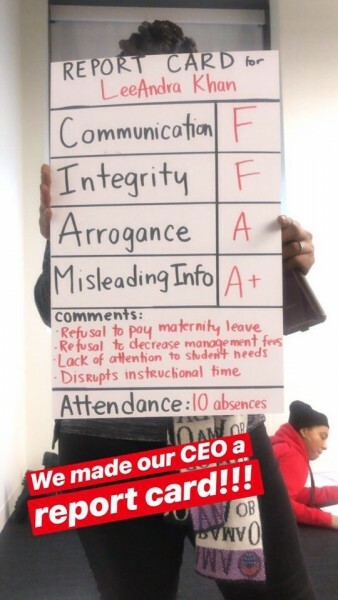 On Wednesday, CICS sent at least eight corporate staff to bust legal picket lines at Wrightwood and Ellison, including Chief of Strategy & Portfolio Christine Leung, who earns $140,000 per year, Director of Network Policy Yesica Rufino-Perez, who earns $100,000 a year, and Chief of Network Services Kathleen Clark, who earns more than $140,000. One CICS corporate employee urged police to threaten to arrest all strikers if even one spoke to parents. "Those are really pricey union busters," said Northtown teacher Jen Conant, who heads up the CTU bargaining team. Management has told parents that children will be punished for unexcused absences (false) and that school was open for instruction (even though 'instructors' are on the picket line, not in school teaching) to try to get children across the picket lines. CICS also for the first time posted security staff at Wrightwood, beginning on the first day of the strike. "That's an awful use of public education dollars that could instead be used to settle the strike and preserve student services," said Conant.